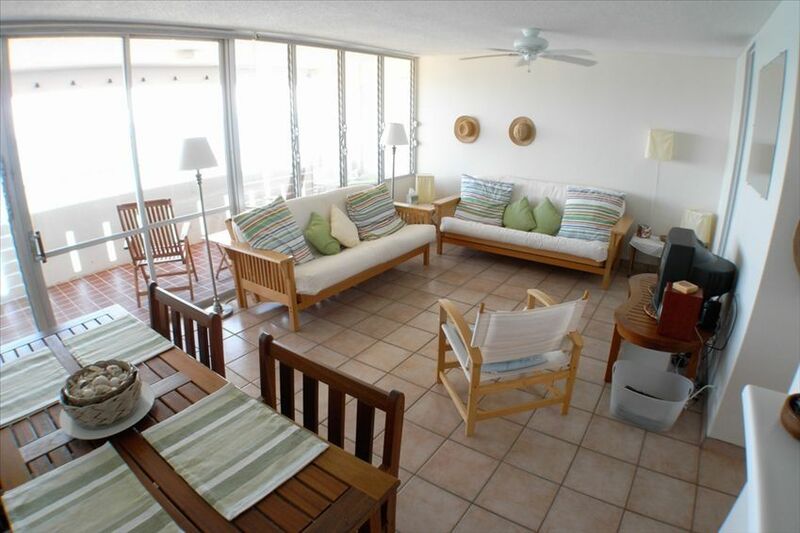 Our family is the original owner of this studio apartment located on the upper floors of Playa Azul I. Playa Azul I, is a 22 floor beachfront condominium, located in Luquillo, Puerto Rico. A beautiful 509 square foot studio apartment which feels very large, due to a 18 foot glass wall facing the grand Atlantic ocean. The entire apartment has been updated and is impeccably maintained. Recent renovations include a complete bathroom remodeling with floor to ceiling Egyptian stone and high quality fixtures and a new stove in kitchen. High-quality sheets and towels are provided. Please note this is a smoke-free environment. High quality, 300-count bed linens. Secure parking area. Condo association charges flat fee of $20.00 for the duration of your stay. High quality, 100% cotton towels. High definition flat screen television. Snorkeling gear and boogie board. Pool is temporarily closed. Please inquire with property owner prior to booking. The view from this apartment is breathtaking. We'd never been to Puerto Rico and this place provided the perfect intro. The beach is five minutes out the door and we loved that it was off the beaten path. We could look out our balcony and see for miles in every direction. The breezes were amazing and we never felt hot or muggy. We always felt safe and the security was high but not over bearing. We walked along the beach to the west and found our own private lagoon protected from the waves with perfectly clear aqua water. Lots of food options close by and very close to the rain forest which is amazing. Nice grocery store is five minute drive. The apartment is small but very nicely furnished. Bathroom is newly redone and very nice. Futon is not that great. Too short and difficult to get comfortable. For the price, this was awesome for what we needed. Sandra was extremely helpful and responsive. One of the best owners we ever worked with. The pool was unfortunately closed for repairs and she refunded some of our payment. Loved our stay here ! Cant beat the view and the sounds of the ocean! Comfy bed! Walking into the apt was breathtaking! The view and sounds and breeze of the ocean was unbeatable! Very clean and had everyrhing we needed --Even beach stuff! Our host Sandra was amazing at being flexible with check in /out times during our stay. Location was great for the rainforest ,bio bay tour, and beaches! Would definately stay here again! Great place very clean and everything you need is there. Close by many sights like rain forest, beaches, old San jaun and ferry to veiquies and culabra. Loved it and highly recommend. Owner Sandra is very nice and helpful. My husband and I just returned Luquillo, and stayed here for the week. We found the condo welcoming, and perfectly located. It was very clean when we arrived and all potential needs were accounted for. I cannot recommend this place highly enough! My husband and I enjoyed our stay at this condo. It was the perfect amount of space for 2 and was very clean and welcoming when we arrived. The few of the beach is spectacular. We thought Luquillo was the perfect spot to vacation in PR. Away from the crowds in San Juan, but in a town large enough to have plenty of meal options. It was convenient to get to the rainforest, which we really enjoyed! The trip to Farjado for snorkeling, kayaking, and breakfast at Las Vistas Cafe was easy too. And the beach just steps away was perfect and never crowded. We appreciated the security for the parking lot and building. Like others, we enjoyed the breeze and listening to the ocean. Do note that the condo doesn't have AC and can get warm. You'll need a rental car to get there and enjoy the area. Sandra was a very helpful owner and a pleasure to do business with. The condo was imaculant! Great location. Condo personnel very helpful. Bed very comfortable! We are already planning our next trip back! A parking fee of $20.00 is paid upon entering the apartment complex and is valid for the entire length of your stay.